I have a newly-hatched family of chickadees in my backyard garden. I have a metal and wood bird feeder that I never even noticed had a bird house built into the top (and I’ve had it for four years! )…an observant Regina pointed out a chickadee had gone into the hole a few weeks ago. 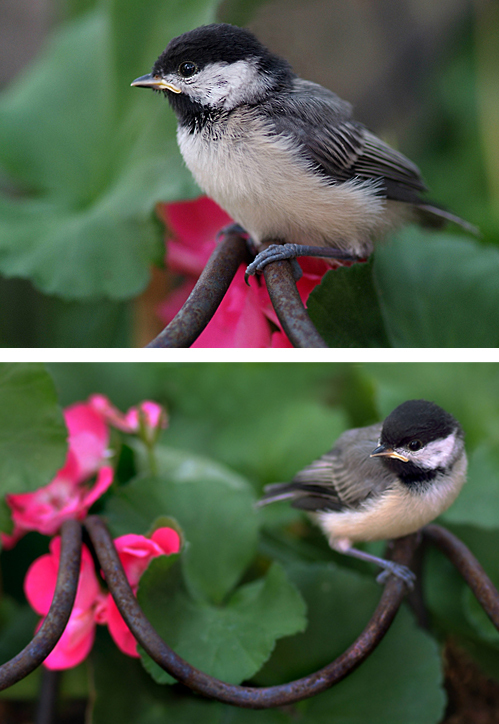 Yesterday I was looking through the patio doors and saw a “miniature” chickadee on one of my plant stands (and you know how tiny an adult chickadee is), and realized it was one of the babies (there are at least two of them).